High School Baseball Annual Spaghetti Dinner Fundraiser! Get your tickets now and come support the Junior Varsity and Varsity Baseball Teams! The Baseball Program is hosting it's annual Fundraiser, please contact one of our High School Baseball students, Richelle Brannock or Ryan Hahn for tickets, they are $10 each and all proceeds go towards funding much needed equipment purchases for the baseball program. Click here for more information! 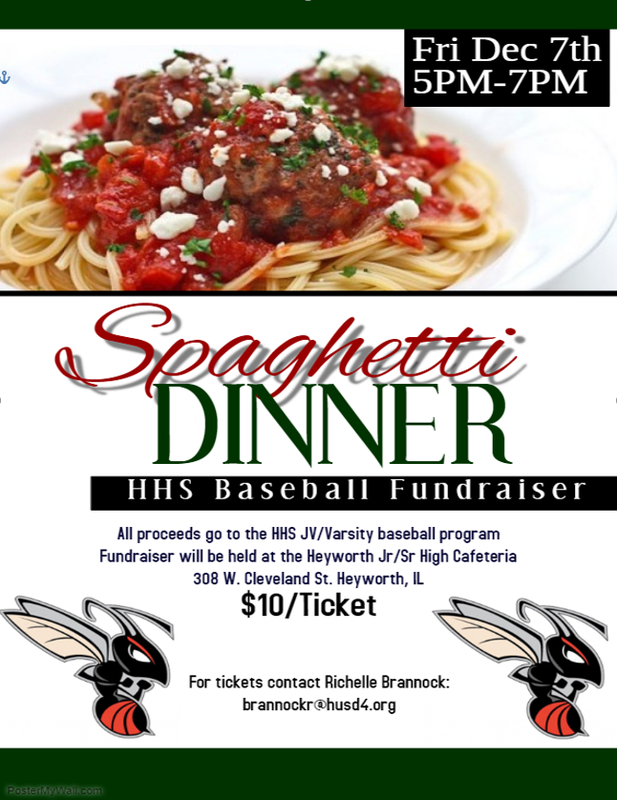 The Heyworth High School Baseball program will be hosting an 'Authentic Italian Dining Experience' fundraiser Friday December 7th from 5-7PM in the JH/HS cafeteria. The boys basketball team will be hosting Tri-Valley so come out, enjoy a nice dinner and catch a game. The lights will be dimmed and the sounds of authentic italian music will fill the air. Chef Kearns' world famous 'Jo Mamma's Spaghetti' will be served along with bread sticks, salad, drink and dessert. Tickets are $10 per person and can be purchased by contacting one of our baseball boys, Mrs. Brannock or Ryan Hahn. All proceeds will go towards funding much needed equipment purchases for the baseball program. Spread the word!